TinyTERM addresses the host connectivity needs of organizations that require access to UNIX, Linux, DEC, HP and other servers. Standardizing on TinyTERM offers easy and economical migration from other vendor's products, with enterprise-grade deployment management tools and integration options providing ease and greater flexibility to control and customize organizational rollouts. Organizations using UNIX and Linux systems can rely on the support in TinyTERM for legacy terminals including DEC VT52 thru VT420, SCO ANSI, and Wyse 60. Advanced deployment capabilities provide flexibility to control and manage the enterprise rollout process. Customized host access configurations can be easily and automatically pushed from corporate file servers to multiple desktops, and are compatible with Microsoft SMS and Altiris installation mechanisms. Pre-defined user configurations and the ability to lock-down user options guarantee a standardized user experience, minimal IT support, and simplified end-user training. Migrating from your existing vendor to TinyTERM is greatly simplified with built-in keyboard and codepage mappings compatible with Attachmate, Hummingbird, and WRQ products. To further speed migration, TinyTERM includes a configuration conversion utility that greatly reduce the time and costs associated with migration. 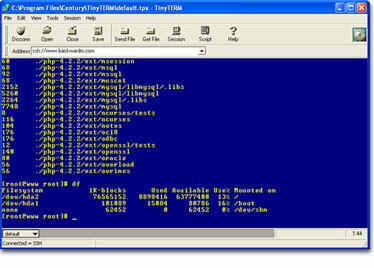 Print management capabilities integrated into TinyTERM allow users to route print jobs to any local or network printer. Print jobs can also be output as files and stored anywhere on the network. Enterprise users can select custom settings and configurations for each printer or print job. TinyTERM offers comprehensive scripting and automation capabilities designed to simplify user operations and increase productivity. Login and authentication sequences can be created and executed with a single keystroke, and complex file transfer sequences can be created to move files securely from one host to another. Users can also create their own sequences with macro record, edit, and playback functionality. Support for industry standards such as COM, OLE, and ActiveX give TinyTERM users a choice of mechanisms to integrate host data with local desktop applications and spreadsheets. File transfer support in TinyTERM allows users to transfer files throughout the enterprise using a variety of protocols, including FTP, ZModem, XModem, and TinyTERM's very own WTERMCRC. Download a free 30-day evaluation now. TinyTERM Plus addresses the host connectivity needs of enterprise level organizations that require access to IBM mainframes, midrange computer systems, and UNIX / Linux servers. Standardizing on TinyTERM Plus offers easy and economical migration from other vendor's products, with enterprise-grade deployment management tools and integration options providing ease and greater flexibility to control and customize organizational rollouts. TinyTERM Plus provides IBM mainframe connectivity with precise TN3270E emulation, including LU1/LU3 printing support and secure host access utilizing strong SSL encryption. IBM AS/400 iSeries support is integrated into TinyTERM Plus with complete TN5250E emulation, LPD printer support, and secure connectivity through SSH1/SSH2 encryption. 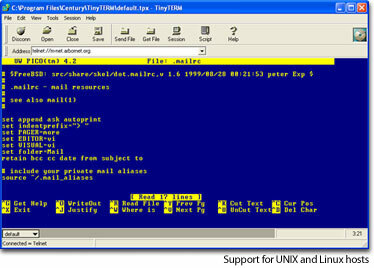 Organizations using UNIX and Linux systems can rely on the support in TinyTERM Plus for legacy terminals including DEC VT52 thru VT420, SCO ANSI, and Wyse 60. SSH1/SSH2 encryption is used to secure all host communications. Advanced deployment capabilities provide flexibility to control and manage the enterprise rollout process. Customized host access configurations can be easily and automatically pushed from corporate file servers to multiple desktops, and are compatible with Microsoft SMS and Altiris installation mechanisms. TinyTERM Plus can be installed directly on Citrix and Microsoft TSE thin client servers for deployment without any desktop installation required. Web server deployment allows automated installation and execution within the desktop browser environment. Migrating from your existing vendor to TinyTERM Plus is greatly simplified with built-in keyboard and codepage mappings compatible with Attachmate, Hummingbird, and WRQ products. To further speed migration, TinyTERM Plus includes a number of script and configuration conversion utilities that greatly reduce the time and costs associated with migration. TinyTERM Plus includes SSL and SSH1/SSH2 for secure host connectivity. Based on strong 1024-bit encryption, these protocols allow users to securely access remote hosts over any network, and safely transfer files between systems. To further safeguard sensitive enterprise data, TinyTERM Plus offers port forwarding, a technology that allows normally unsecure communications like email or web surfing to be encrypted site-to-site, thereby ensuring the privacy and integrity of user communications. Print management capabilities integrated into TinyTERM Plus allow users to route print jobs to any local or network printer and allow local desktop printers to act as additional network print resources. Print jobs can also be output as files and stored anywhere on the network. Enterprise users can select custom settings and configurations for each printer or print job. TinyTERM Plus offers comprehensive scripting and automation capabilities designed to simplify user operations and increase productivity. Login and authentication sequences can be created and executed with a single keystroke, and complex file transfer sequences can be created to move files securely from one host to another. Users can also create their own sequences with macro record, edit, and playback functionality. Support for industry standards such as HLLAPI, COM, OLE, and ActiveX give TinyTERM Plus users a choice of mechanisms to integrate host data with local desktop applications and spreadsheets. TinyTERM Plus also includes CScript, one of the most comprehensive scripting languages available. Using CScript, the entire desktop user interface can be modified and deployed as a custom application. File transfer support in TinyTERM Plus allows users to transfer files throughout the enterprise using a variety of protocols. Support for IBM mainframes and servers includes IND$FILE host file transfer, and a graphical drag-and-drop FTP client allows secure file transfers utilizing SFTP, SCP, and SSH protocols.